Swifts are uniquely adapted to life on the wing. They are mainly known and popular when a large number of them fly through our towns and cities on a warm summer evening, hunting for flying insects. During the summer months Swifts spend just four months in Europe, where they can be found all over the continent. They normally breed up to around 1,000 m above sea level. Winters are always spent south of the Sahara, for example, at the “Cape of Good Hope” in South Africa. Once they have been accepted, breeding sites are used by the same pair for many years, which means that removal of these roosts constitutes a serious threat to the Birds, as their familiar breeding site is missing on their return. Swifts are very social animals, so that colonies can form with any number of Birds. 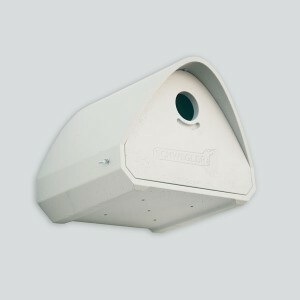 It is therefore advantageous if several nesting aids are installed. In principle a Swift pair occupies a nesting aid for one annual brood. The survival of the Swift in our towns and cities is now under threat. This Bird species occupies niches and voices on all kinds of buildings. These places are often destroyed, blocked or at least made uninhabitable by building renovations or new buildings. 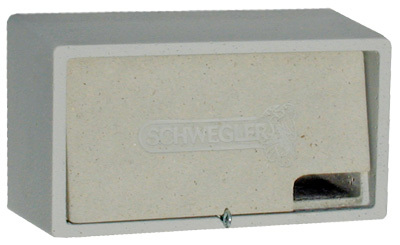 SCHWEGLER replacement roosts can be used to create a very successful remedy. You can paint our nest boxes at any time with breathable paint to match the colour of the building façade. Please ensure that you only use paint that is “breathable”.“. Why is it necessary to exclude Starlings? Firstly: no-one who is seriously concerned about the protection of species has any objections to Starlings – quite the contrary. In designing starling barriers the intention is to assist the protection of all species. 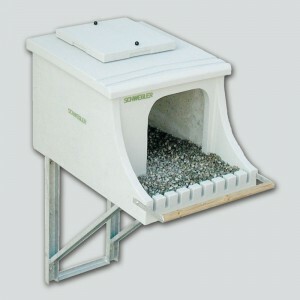 Therefore we supply also various different types of nesting boxes specifically for Starlings. However, we have to accept that Starlings can present a problem when they nest on buildings, usually ­because of the mess that they make on and around the building, for example on “prestige” buildings or in areas used by the public. 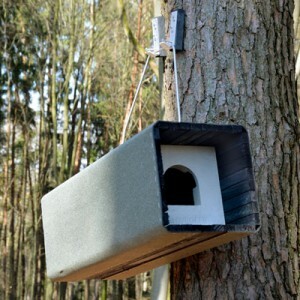 This often results in a reduction in the number of nesting aids for Swifts, which in turn means that fewer breeding areas are available for them. 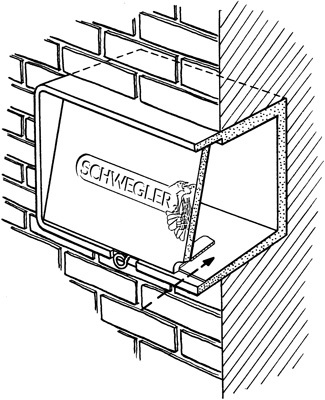 Where nesting boxes are occupied by Swifts their habits definitely do not result in the fouling of buildings. Selective projects for monitoring Swifts have shown how welcome this starling barrier is as a means of reducing unwanted occupancy. How the starling barrier operates: The anatomy of the Starling (long legs etc.) prevents it from getting through the barrier and into the brood chamber that lies behind it. 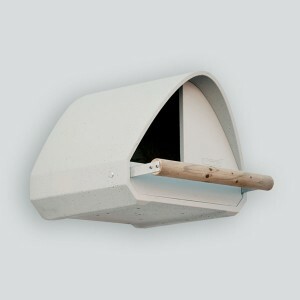 Swifts have very short legs, enabling them to easily gain access through this tunnel. Tests conducted over many years have proved the effectiveness of this system. 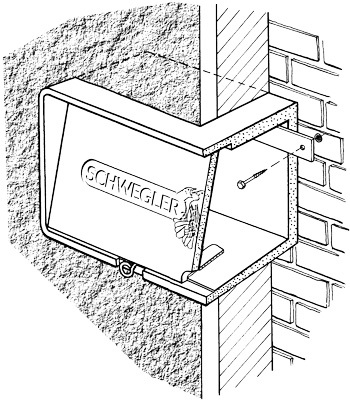 Installing the barriers in existing boxes/places: Barriers should not be installed in existing brood boxes because the Swifts enter the box at a high speed and can injure their beaks. 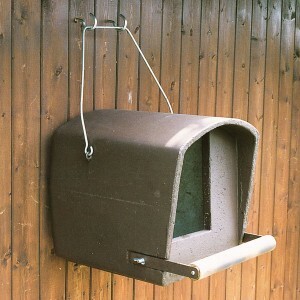 It is well known that when Swifts return to their previous year’s sites they tend to fly “blind”. Installation: similar to No. 16 as shown above. However, the No.16S can be fully inserted into the walls up to 16 cm deep. 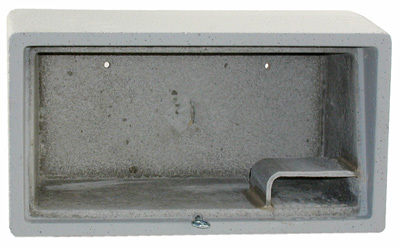 Interior dimensions: W 36 cm x H 17 cm x D 16 cm. External dimensions: W 43 cm x H 24 cm x D 22 cm (incl. fastener).